29/9/13 - Acquisitions - Valenciennes, Musée des Beaux-Arts - Since our last article highlighting acquisitions at the Musée des Beaux-Arts in Valenciennes, the museum has added several more important works, thanks to both donations and purchases. The Carpeaux holdings have thus expanded with a drawing representing Saint Jerome (ill. 1 ), executed after the famous painting by Domenichino, The Last Communion of Saint Jerome at the Vatican museums, which was donated by the Amis du musée. During his stay at the Villa Medicis between 1856 and 1862, after being awarded the Prix de Rome, Carpeaux had planned to sculpt a figure of Saint Jerome alone for his fourth year work to be sent back to Paris, following the advice of the Academie de France director, Jean-Victor Schnetz but then abandoned the project, making instead the more original choice of a group representing Ugolino and his Children. This study after Domenichino was done possibly in preparation for the first work. A private collector in fact donated a preparatory wax study for the Ugolino group (ill. 2) in 2011, which he had purchased at a Piasa auction on 13 December 2002. Since the very beginning of the very long preparation for this work, Carpeaux acknowledged turning to the Laocoön for his inspiration. In 1857, in his first mention of it in a letter to his friend Charles Laurent-Daragon, he wrote : "This is an extremely dramatic subject, it is very analogous to the Laocoön." At the time, he was planning on a compositiion in relief as requested for his second year work to Paris, before changing his mind a year later and opting instead for a free-standing figure. The work donated to Valenciennes is one of the first drafts for the latter, the only known one in which there are only two children (the number would change later to three in several studies, with the final group for which Valenciennes holds a life size execution model in patinated plaster, presenting four). Two other acquisitions concern another of the museum’s strong points : the French 18th century. The first is a unpublished drawing executed in three chalks by Antoine Watteau, identified by Pierre Rosenberg and purchased from the Franck Accart Gallery in Paris (ill. 3). 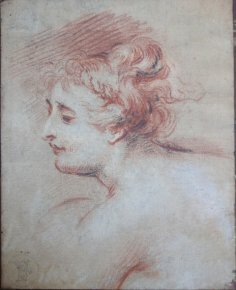 This head of a woman is a copy after a figure from La Félicité de la Régence by Rubens in the cycle corresponding to the life of Marie de Medecis today residing at the Louvre. It comes from the collection of the sculptor Jean-Jacques Feuchères, showing the mark. This is the first work by Watteau to join the collections in Valenciennes since the purchase in 1999 of the decorative panels painted for the Hôtel Nointel in Paris, The Faun and The Charmer. Finally, a wash watercolor by Olivier Le May (ill. 4), an artist who was born in Valenciennes and was a student of Philippe-Jacques de Loutherbourg, was purchased by the museum from the Tristan de Quelen Gallery in Paris. This landscape with figures, influenced by Dutch painting from the previous century, comes from the collection of Roger de Portalis. The Museum in Valenciennes already owned a travel log by the artist, acquired in 1996, two paintings sent to the city as reception pieces to the Académie de Valenciennes and also three drawings. We should also remember that the Louvre had received a bequest in 2006 of a beautiful landscape drawing by this artist, close to the works of his master, Loutherbourg.